Any new pup that comes into our extended family here at DogLoverStore.com is a blessing! So, we would like you to meet Oliver! Oliver is a Goldendoodle, a golden retriever and poodle mix. We absolutely love the name Oliver. It’s such a PERFECT name for a dog and it fits his personality wonderfully. Hm, we wonder if Oliver will pick up a nickname, like Ollie or Liv. That will be determined in time! Our aunt and uncle, who are Oliver’s new mom and dad, found Oliver at a charming spot in Massachusetts. 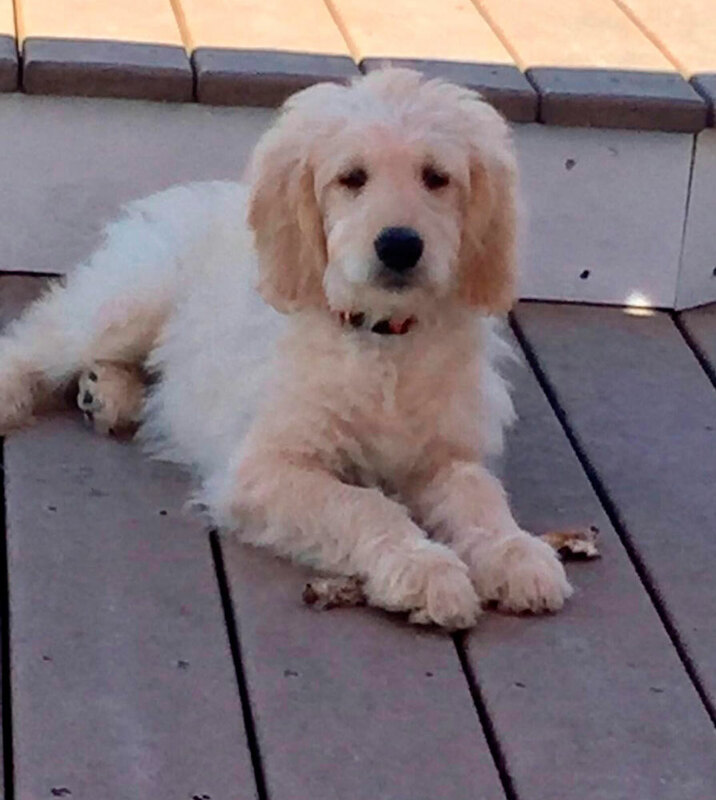 They knew they wanted a Goldendoodle for a while and when the time came, they knew it was time to bring home a sweet Goldendoodle. As you can see, Oliver has a beautiful light golden coat. 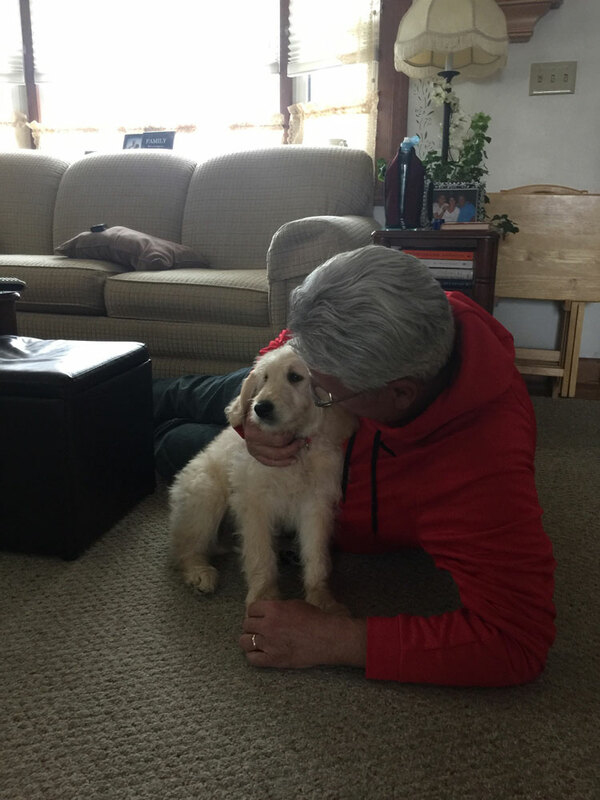 Some of the other Goldendoodle puppies had darker coats with hints of brown and red but our aunt and uncle had their eye on Oliver. which comes from the poodle’s personality. Our aunt and uncle hope he will continue with this independence so he doesn’t develop any sort of separation anxiety, which can be very common with dogs. My aunt works from home so she will be making a conscious effort to make sure Oliver maintains his confidence and independence. This will be important for the future so she can leave the house to do errands and know that Oliver is comfortable being home alone. Oliver will grow to be about 45 pounds, which is an average weight for an adult Goldendoodle. Some Goldendoodles weigh less (under 20 pounds) and they are considered miniature Goldendoodles. Right now, Oliver’s coat has a shaggy look with not much curl. 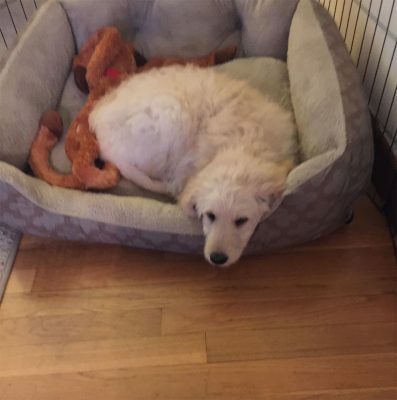 As he grows, his coat will become more curly and it may even change in color a little bit. My aunt does a fabulous job at brushing out her dog’s coats, which is important for any sort of poodle-mix. Poodles have a very thick, dense, and curly coat. Golden Retrievers have a double coat which sheds seasonally. So with the combination of a thick, curly Poodle coat and double Golden Retriever coat, Oliver’s coat will have to be well-cared for. 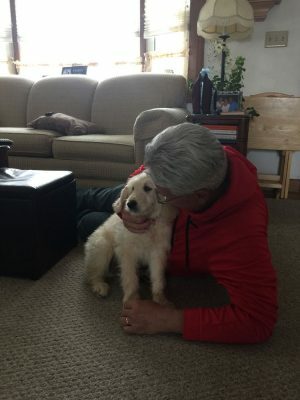 We are absolutely thrilled to have a new member of the family here at DogLoverStore.com! We can’t wait for all the loving memories Oliver will add to our family gatherings. Don’t you worry, we will be sharing photos of him as he grows!